An intriguing photo of a white headed bear caught the attention of wildlife experts in Ontario recently who think they know the reason why. The bear looked as though it might be a North American panda bear (if there was such a thing) or possibly the cream colored Kermode bear or spirit bear that sometimes pops up in Canada. Ron Lafontaine said he took the picture of the white headed bear in a neighborhood near Val Caron, Ontario. The man who’s been hunting since he was 17 said he’s never seen anything like it. Had he discovered an entirely new species? “I was very excited,” he said, adding that seeing the bear made his day. “I showed everybody in the family. They’re in disbelief until you show him the pictures. The picture shows 1,000 words.” he told Sudbury.com. 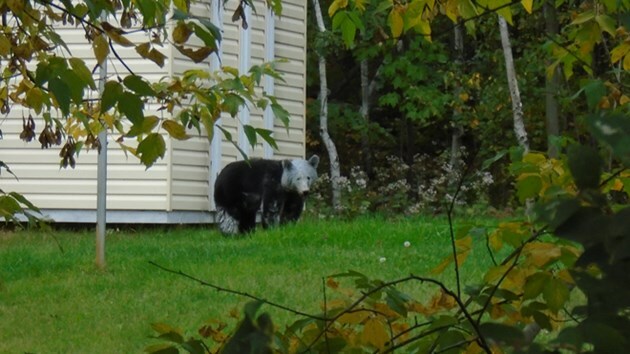 But after closer examination of the photos a regional outreach specialist in the Ministry of Natural Resources thinks she may know the reason for this bear’s white coloration. So it’s just the case of another curious bear. Those bears will never learn.